It’s the greatest couplet in the restaurant industry: Taco Tuesday. Alliterative, similarly syllabic, tacos. Promises a day devoted to the world’s perfect meal -- at a discount, even. Taco Tuesday specials exist all across the United States, from Los Angeles to small town Tennessee, food trucks in the barrios to high-end restaurants in hipster haunts. And if people aren't eating out, they are frequently making tacos at home. So where did this idea come from? Why is it Taco Tuesdays and not Taco Thursdays or Taco Sundays? Since 1989, Taco Tuesday® has been a registered trademark of Taco John’s, one of the largest Mexican restaurant chains in the United States. Never heard of it? That's not too surprising. While it has 400-plus locations, the chain mostly operates in the Midwest, and it’s based in Wyoming. Their biggest claim to culinary fame is Potato Olés® -- flat-tasting tater tots that you can dip into guacamole, queso, or salsa. 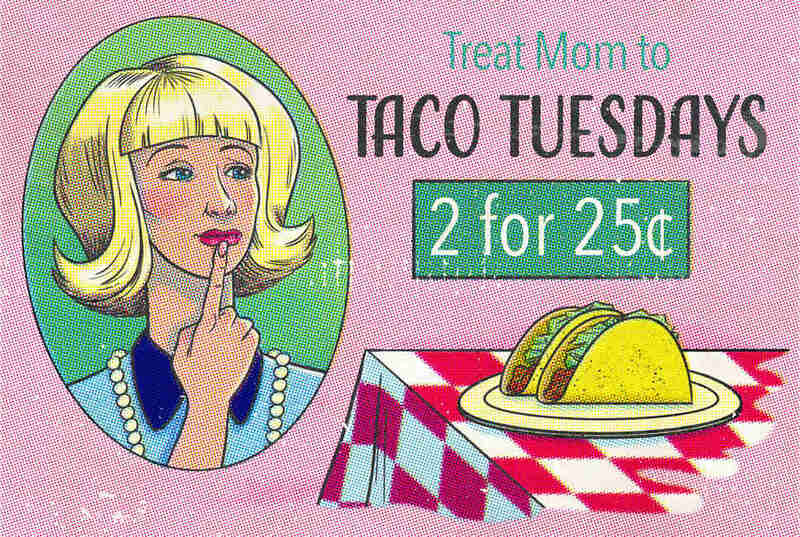 The restaurant is far more infamous for their campaign to keep Taco Tuesday® all to themselves. While many other restaurants use the phrase, they legally cannot. The move always prompts angry articles by media watchers befuddled that anyone would ever copyright a phrase as ubiquitous as Taco Tuesday. Trying to pin down who “invented” Mexican food dishes and customs is a parlor game riddled with charlatans and tall-tale tellers. There are at least a dozen origin stories for the margarita, more than a few for Korean tacos, and too many theories about the origins of burritos to even pay attention. But on the subject of Taco Tuesday, the evidence is clear: Taco John’s doesn’t know what it’s talking about. And the phrase was in existence long before the chain got around to filing for its trademark. But that ran contrary to Taco John’s own website in 2011, that stated Taco Tuesday® started in Rapid City, South Dakota, in 1982. Which contradicted their 2010 press release that said the company started Taco Tuesday® in 1983. And ran aground of a Taco John’s spokesperson who told The Oklahoman in 2010 that the special began in February 1982. Taco John’s own trademark application on file with the United States Patent and Trademark Office shows the company claims it first used Taco Tuesday® in 1979. But by then, the phrase had been in use for nearly a decade across the United States -- and the tradition of a taco special on Tuesday went back even longer. The earliest-documented advertisement for a Tuesday taco special I could find is in the classified section of the October 16, 1933, edition of the El Paso Herald-Post. Under the headline "Some Good Things to Remember," the White Star Cafeteria at the St. Regis launched a weeklong campaign to let everyone know it sold "Mexican Tacos" on Tuesday -- three for just 15 cents. Newspaper clippings from across the country showed restaurants offered Tuesday taco specials in the ensuing decades, sometimes coming deliciously close to using “Taco Tuesday.” Albuquerque’s Zia Lounge gave away free tacos on Tuesday in early 1949. Around the same time, Oliver’s in Green Bay, Wisconsin, featured a Tuesday taco deal -- free coffee with every purchase. 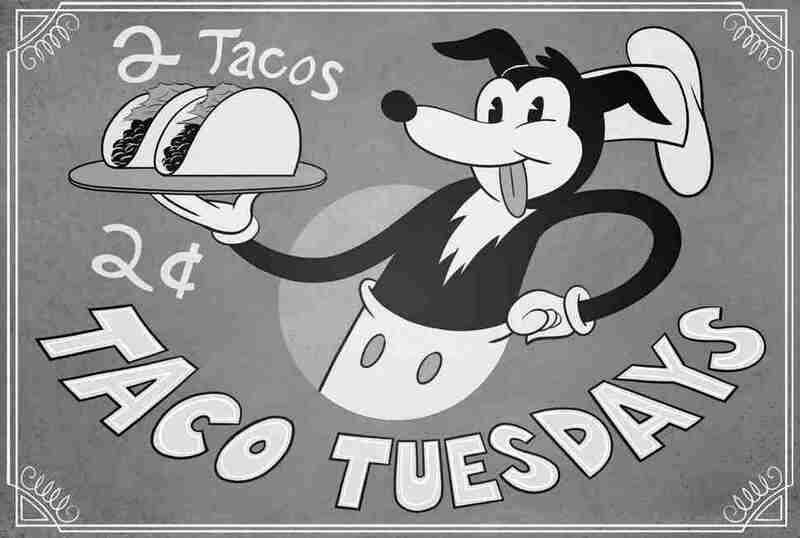 A restaurant called La Cucaracha declared tacos were their “Tuesday special” in the April 13, 1965, edition of the Minneapolis Star Tribune; a small ad in the January 31, 1967, Arizona Daily Star asked readers to "Stop at Pinky's for Tacos"; the next line said, “Tuesday, 6 for 98 cents.” And Combe's Dining Parlor told readers of the Ogden Standard-Examiner in Utah to “Try our Tasty Tacos Tonight” on March 5, 1968 -- a Tuesday. But the first true documented use of “Taco Tuesday” appeared in the August 20, 1973, edition of the Rapid City Journal in South Dakota. Under the drawing of a Spanish flamenco dancer, the Snow White Drive In asked people to “Stop in on Taco Tuesday.” The Spanish motif continued in Manhattan, Kansas, two years later, where a restaurant called Marti's announced “Every Tuesday is Taco Tuesdays,” complete with a drawing of a bullfighter. “Crisp shell, tangy meat, lettuce, cheese and sauce make our tacos always a treat,” read the ad in the Manhattan Mercury. Cost? Nineteen cents for one. They still advertise Taco Tuesday specials without the ® as recently as this week. Meanwhile, the earliest Taco Tuesday® usage by Taco John's appeared in the December 2, 1979, edition of the Longsport Pharos-Tribune in Indiana. Two years later, a Taco John's in Sioux City, Iowa, ran a Taco Tuesday ad with the disclaimer “Every Tuesday thru March,” suggesting the chain hadn't instituted the program nationwide. But by 1982, the special appeared in newspapers from Kentucky to Montana to South Dakota -- and the “Taco Twosday” promotion that the Taco John’s spokesperson told Priceonomics kicked it all off was first used in Salina, Kansas, not Minneapolis. The fact that the Midwest became such a locus for some of the earliest Taco Tuesday® efforts doesn’t surprise Steven Alvaraz, an assistant professor of English at St. John’s in Queens. He teachers a course called “Taco Literacy” in which he shows students the hidden political, economic, and cultural meaning behind tacos. "It demonstrates the ubiquity of Mexican food." 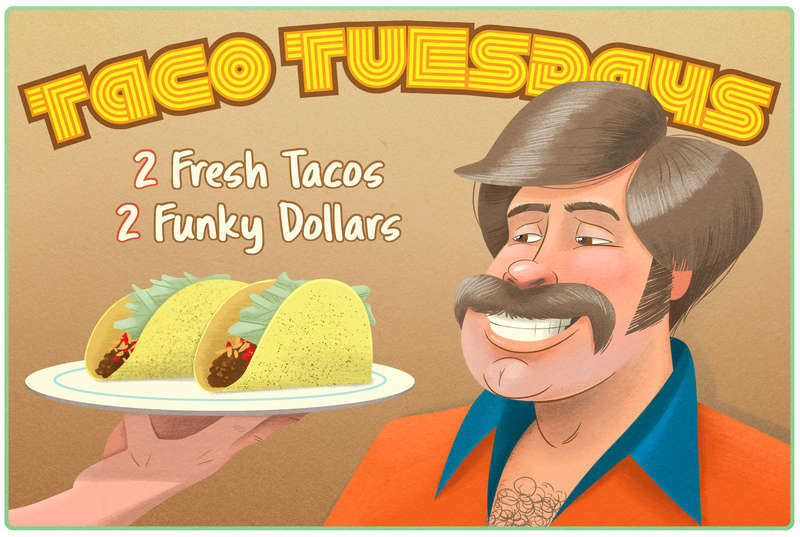 It’s that promise of exclusivity -- to be able to say they’re the only place that can use the phrase to advertise cheap Tuesday tacos -- that made restaurants try to legally claim “Taco Tuesday” long before Taco John’s got around to it. Gregory’s Restaurant and Bar in Somers Point, New Jersey, actually holds the trademark for Taco Tuesday® in New Jersey because it filed for it in 1979. In 1997, Tortilla Flats in Laguna Beach filed a federal trademark infringement suit against seven restaurants over the phrase "Taco Tuesday," claiming they owned it. They sought $5 million in damages; it settled out of court. Alvarez is ultimately bemused at the Taco Tuesday® battles, mostly because he notes it’s more of a white obsession. “Among Mexican folks, the idea that one day of the week could be reserved for tacos is ridiculous. We don't need to call it ‘Taco Tuesday’; we just call it ‘Tuesday.’"
Gustavo Arellano is the author of Taco USA: How Mexican Food Conquered America and is a strong advocate for Mezcal Mondays and Sotol Saturdays—but he would never copyright those phrases!